1) About 95% of the world’s olive oil is produced in the Mediterranean region. Consistently, the top two olive oil producing countries are Spain (about half of world supply) and Italy (about 15%). The US produces only about 0.3% of the world’s olive oil. 2) While most household cooking oils are derived from seeds, olive oil is made from a fruit – the olive! 3) Unlike seed oils, olive oils originate through natural physical extraction. Extra Virgin Olive Oil is made entirely by mechanical processes without added heat or chemicals. Olive Oil is a blend of refined olive oil with some virgin or extra virgin olive oil added for flavor. 4) Olive oils labeled “light” or “extra light” refer to the flavor, not the fat or calorie content! Light-tasting olive oil has very little virgin olive oil blended in and therefore has a very subtle taste. (more about non-extra virgin olive oil). 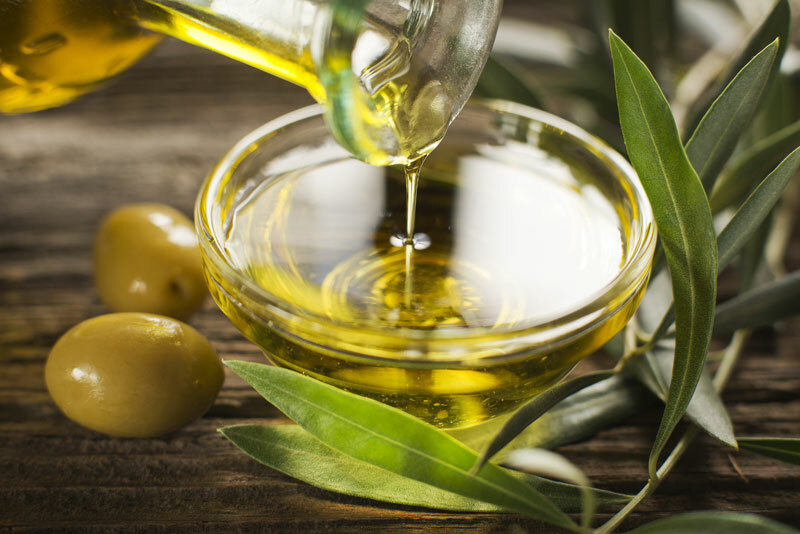 5) Olive oil is the primary source of fat in the celebrated Mediterranean Diet. Greeks consume more olive oil than another country – about 20 liters/5.3 gallons per person annually! Other high-consuming populations include Spaniards (about 13 liters/3.4 gallons per capita) and Italians (about 11 liters/2.9 gallons per capita). By contrast, American per capita consumption is only about 1 liter/1 quart per person – offering lots of opportunities to replace less-healthy options with olive oil! 6) Contrary to popular belief, the color of an extra virgin olive oil is not an indicator of its quality or flavor. There are hundreds of olive varieties that produce different hues of olive oil. Growing conditions (temperature, water, etc) and harvest time affect color as well. Good quality extra virgin olive oils range from yellow to green. 8 ) Extra Virgin Olive Oil offers the most flavor and can be used for everything from finishing and dressing to average stovetop cooking. Olive Oil and Light-Tasting Olive Oil enhance foods without overpowering the flavor of your recipes and can be used for everything including sautéing, grilling, and baking. Yes, you CAN cook with olive oil! 10) You can substitute olive oil for any cooking oil in equal amounts! Olive oils can also replace butter or margarine in many recipes, which will reduce saturated fat and cholesterol. Use this handy conversion chart to make the swap!